The Great River Road is one of the world’s premier spots for birding. The road traces the Mississippi Flyway, a migration route followed by 40 percent of North America’s waterfowl and shorebirds. The Great River Road is flanked by vast refuges, expansive forests and beautiful parks that provide rich habitat and protection for these beautiful creatures. Travelers on the Great River Road have the opportunity to encounter an abundance of species and there are endless places to relax and take in the beauty of the flyway’s birds. Itasca State Park. The home to the headwaters of the Mississippi River, Itasca State Park in Minnesota, hosts birds in its boreal forests and mixed hardwoods. Established in 1891, Itasca State Park is Minnesota’s oldest park. With 222 species found here, it’s also one of Minnesota’s premier birding locations. Reelfoot Lake State Park. Located in the northwest corner of Tennessee, Reelfoot Lake was created by a series of earthquakes in the early 1800s and today is a magnificent wildlife viewing and birding location. You’ll find many varieties of shore and wading birds here and white pelicans and eagles pay seasonal visits to the park. National Eagle Center. Want to get up close and personal with an eagle? Pay a visit to Wabasha, Minn., where you can meet bald and golden eagles at daily demonstrations or take a look at eagles perched above the Mississippi River from the observation deck. Dale Bumpers White River National Wildlife Refuge. This refuge—located in southeastern Arkansas—was created in 1935 specifically to protect migratory birds. Birders can find countless species among the beautiful forests and lakes. Clarks River National Wildlife Refuge. In western Kentucky near Benton, this 8,500-acre refuge contains bottomland hardwood forests used by over 200 species of neotropical songbirds for a migration stopover spot or for nesting. With warm spring temperatures come the flocks of migratory birds, flying north along the Mississippi River. The Mississippi Flyway is the migration route followed by 40% of all waterfowl and shorebirds in North America. Wildlife refuges, state forests, federal forests and parks protect the crucial habitat and food sources for these birds. Bald eagle. Watch our nation’s bird soar over the pines and lakes along the Mississippi. Nearly every state from Arkansas to Minnesota boasts superb bald eagle viewing. The conditions of the Mississippi are simply plentiful. If you want to learn more about the majestic bird, the National Eagle Center in Wabasha, Minnesota is a regional favorite for group visits. Climb into an eagle’s nest, meet the resident raptors, or join a guided field tour to see the birds the in wild. Further south, at the Mississippi River Visitor Center in Rock Island, Illinois, you’ll find a bald eagle hot spot. This location is best in late winter and very early spring, when the eagles gather near the open water to feed. White pelican. These shy white birds start migrating north in early March. They’re frequently spotted near locks and dams near state parks, like the Upper Mississippi Wildlife and Fish Refuge near Bellevue, Iowa. Prothonotary Warbler. This small vibrantly yellow songbird is conspicuous all along the lower Mississippi River states, like Arkansas, Louisiana, Kentucky, Missouri, and Tennessee. When the weather warms, you’re sure to spot it migrating north from its summer near the West Indies. It forges for food in hardwood swamps and nests in natural and artificial cavities like woodpecker holes. Great blue heron. Watch this majestic bird stalk its prey in shallow wetlands before taking flight with a loud squawk and a loud thump from its 6 foot wingspan. Great blue herons nest in treetop colonies called rookeries. You can find rookeries along the islands in Minnesota, like the North Mississippi River Park in Minneapolis, or the wetlands of Tennessee. Ivory-billed woodpecker. If you happen to spot this quirky bird, consider yourself one of the few. Thought to be extinct, this bird was spotted flying over Arkansas in 2002. The Dale Bumpers White River Widelife Refuge in Arkansas is home to 300 lakes and ponds, making the Bottomland Hardwood Forest and the White River an ideal home for migrating birds, and maybe, just maybe, the ivory-billed woodpecker. Want more birding advice for your Great River Road experience? Be sure to check out our page devoted to bird-watching. November is Native American Heritage Month, a time to celebrate the rich history of our great nation, especially the Native American influences along the Great River Road. Here are a few stops along the Mississippi that honor the diverse cultures and influences of Native American people. Effigy Mounds National Monument (Iowa) – Located just four miles north of Marquette, Iowa these sacred mounds are associated with as many as 20 different American Indian tribes. There are more than 200 mounds surrounded by some of the most beautiful views of the Upper Mississippi River Valley you’ll ever experience. Toolesboro Indian Mounds & Museum (Iowa) – These Wapello, Iowa mounds claim to be the “best-preserved and accessible remains of an ancient culture flourishing from 200 B.C. to A.D. 300.” Stop in the visitor center to learn about the Hopewellian people who created these beautiful mounds. Black Hawk State Historic Site (Illinois) – This site in Rock Island was home to native peoples beginning 12,000 years ago up until about A.D. 250. This area was the land of the Sauk and Meskwaki people, then an amusement park, then a rail line. In the 1930s, veterans of the First World War transformed it into a historic site with trails, parking lots and shelters, planting trees and wildflowers along the way. Cahokia Mounds State Historic Site (Illinois) – Cahokia was once one of the greatest cities in the world, and was larger than London in A.D. 1250. These remains claim to be of “the most sophisticated prehistoric native civilization north of Mexico.” It’s also home to Monks Mound, the largest man-made earthen mound in North America. The people of this area were builders, unsurpassed in their skills at the time. Wickliffe Mounds (Kentucky) – In Wickliffe, Kentucky you’ll find the site of a village once belonging to the Mississippian Native Americans. Beginning about 900 years ago, these peaceful farmers grew and prospered here until the village was mysteriously abandoned in the 1350s. Don’t miss the Archaeology Walking Trail tour or the hands-on activity stations. Trail of Tears State Park (Missouri) – This scenic state park is a sobering reminder of one of America’s saddest chapters, the Trail of Tears March, which forced tens of thousands of Cherokees from their homes. A stop here will help you to better understand the great sacrifice native people endured. August is Family Fun Month, so hop in the car, get on the Great River Road and check out these family-friendly stops along the way. Minnesota – Mall of America, the largest shopping mall in the country is in Bloomington, Minnesota. Sure there are more than 400 stores, but there’s also a theme park, an aquarium, a comedy club, a mini golf course and more. Fun for all ages and interests. Bring your sneakers. Wisconsin – In La Crosse, drive or hike to the top of Grandad Bluff. Have a picnic and enjoy the amazing views of this robust river town. After lunch, head downtown to the Gertrude Salzer Gordon Children’s Museum. You’ll find three floors of hands-on exhibits, including a giant Operation game, a kid-sized convenience store and a television news set. Iowa – The National Mississippi River Museum & Aquarium in Dubuque is a must-see. Learn about the history of the river with historical exhibits and 3D and 4D theaters, then visit the aquarium and explore the wildlife that calls the river home, including turtles, fish, otters, even alligators! Illinois – Head to Grafton and conquer your fear of heights together as a family! The Grafton Zipline at Aerie’s Winery has nine lines, nearly two miles in total length. Peak height? 250 feet up. It’s an exciting experience that’s safe enough for even your little ones. Missouri – Your kids are bound to come across Mark Twain’s many works during their school years. Take them to Hannibal, Missouri to visit the author’s boyhood home. (It’s where the real adventures of Tom Sawyer took place!) You can also visit the Huckleberry Finn House, where the real Huck Finn grew up, and see seasonal performances of Twain’s works. Tennessee – In the northwest corner of Tennessee you’ll find Reelfoot Lake State Park. The lake was created in the early 1800s by violent earthquakes that forced the Mississippi River to flow backwards. If that cool story isn’t enough for you, the lake is also a flooded forest, dotted with Cypress trees and home to tons of wading birds and waterfowl. Catch a canoe or pontoon boat tour and explore this unique gem. Arkansas – Arkansas’s largest natural lake, Lake Chicot is a site to behold. Twenty miles long, the lake is nestled in a pecan grove, so the scenery is absolutely stunning. Rent a pontoon, fishing boat or kayak and spend the day exploring. There are wildlife tours available and a visitor center with interpretive exhibits that tell the story of the area’s natural history. Mississippi – In Clarksdale, you’ll find the Delta Blues Museum. Situated in the “land of the blues,” this museum will teach your kids valuable musical history through sculptures, photography, interactive exhibits and of course, plenty of tunes. Louisiana – At the end of the Great River Road, you’ll find great family fun. New Orleans is home to the Audubon Zoo, one of the top-ranked zoos in the country, with unique animals like white tigers and white alligators. It’s also home to Mardi Gras World, a hands-on museum celebrating the annual festival. Here kids can watch the floats being built, try on traditional costumes and sample king cake. May is National Bike Month, so hook the bike on the car and hop on the Great River Road for an early summer adventure you won’t soon forget. Try exploring a classic river town on two-wheels along the Mississippi River Trail. It’s nearly 3,000 miles of on-road bikeways and pedestrian and bike paths you can take from Minnesota to the Gulf of Mexico. Find out more about the Mississippi River Trail and get detailed maps here. There are numerous places along the Great River Road that are best enjoyed with a loved one. The beauty of this amazing river is simply wonderful to share. Here are seven beautiful spots along the Great River Road to savor with someone special. 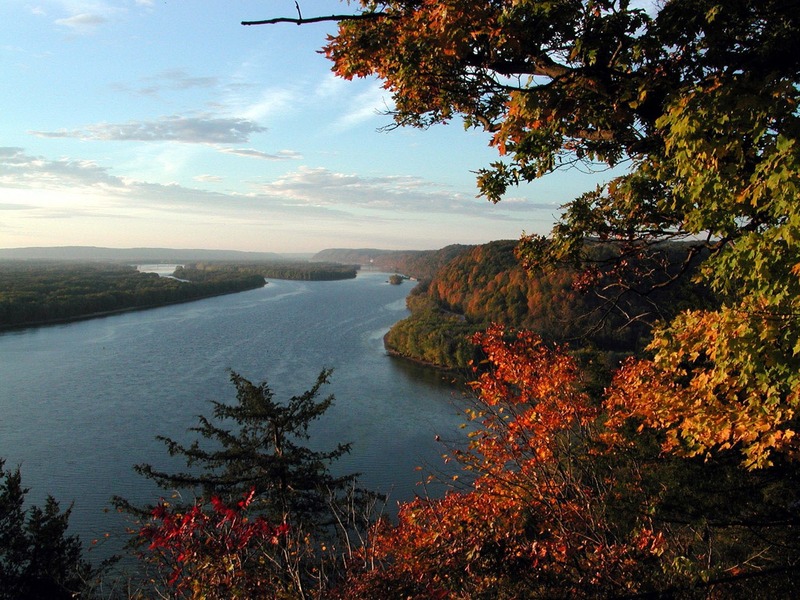 Great River Bluffs State Park, Winona, Minnesota: Enjoy breathtaking views of the Mississippi River Valley. Perrot State Park, Trempealeau, Wisconsin: Walk up to the overlook and take in amazing river views from the Wisconsin bluffs. Effigy Mounds National Monument, Harpers Ferry, Iowa: See more than 200 American Indian mounds in this picturesque protected area. Sunset Park, Rock Island, Illinois: This is a perfect place to watch the light change as the day grows late. Wickliffe Mounds State Historic Site, Wickliffe, Kentucky: Enjoy a spectacular view of the bluff area on top of the Ceremonial Mound. LSU Rural Life Museum and Windrush Gardens, Baton Rouge, Louisiana: This picturesque site offers a look at the past and it serves as a beautiful backdrop of many weddings and special events. Learn more about special places on the river here. Fall is the perfect time to drive the Great River Road. Vibrant colors paint the trees from Minnesota to northern Mississippi, and you’ll find festivals, farmers markets and fun activities all along the Mississippi River corridor.